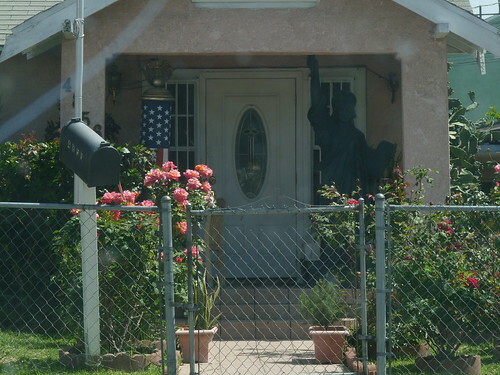 It’s not unusual to see the Stars & Stripes hanging from poles on someone’s house, but since moving to El Sereno, this house has captivated me. The photo is somewhat dark, but yes you can see the small scale Statue of Liberty on the porch. There is also a flag banner on the other side of the door. In front of the house, cut off from this photo is a 25′ flag pole. You can see that in the wider view here. One of these days, I’m going to have a chat with the residents to find out where they got that Statue of Liberty.